I mentioned in an earlier post that I bought two clone dolls at the Doll Show. I haven’t really bought fashion doll clones for quite a long time as I’ve been concentrating on genuine Barbie, Sindy and Tammy when I’ve bought vintage dolls. However, these two I felt needed me to buy them. I saw them on my first circuit of the hall, I usually do about three. There was a Sindy clone. I had to look closely she was a very good resemblance. Good quality vinyl and her face was so like she might have been made with a Sindy mould. On her back she was just marked “Hong Kong”. Her tag said ten dollars and I thought that was not a bad price. Next to her was a Barbie clone of a similar age, early to mid 1960s also made in Hong Kong. 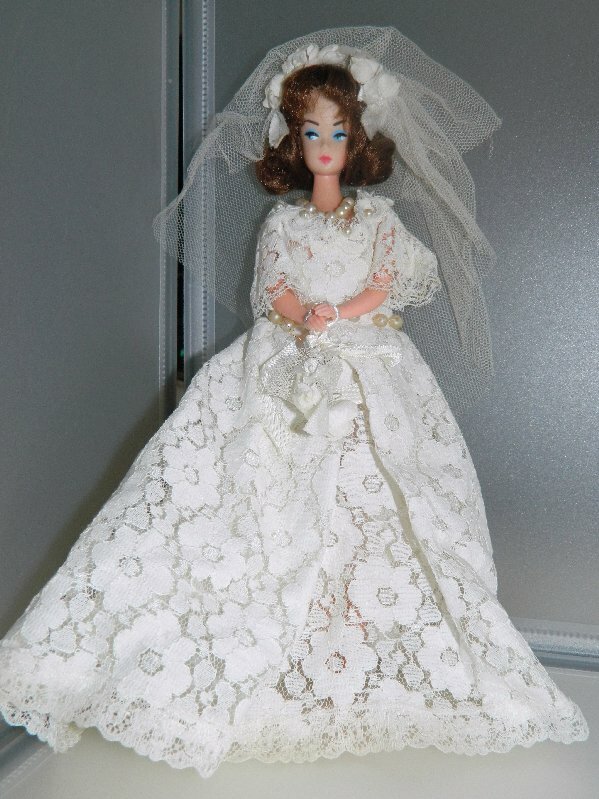 She was wearing a wedding dress and while she was obviously not Barbie she was quite well made too and was tagged fifteen dollars. I thought about buying one or both of them but it was my first circuit and I don’t like to buy until I have seen everything. I miss things that way sometimes but I don’t have a big doll budget so I don’t want to spend it all too soon. On my next pass the two dolls were still there but I was still deciding as I had seen one or two other dolls I was thinking about and did I really want a couple of clones? After that I decided to buy the two dresses for Sweet Sue and Marilyn and as I’d spent quite a lot by then I didn’t think I ought to spend any more money. I had a cup of tea and decided to do one more circuit before leaving. When I reached the stall where I’d seen the clones I couldn’t see them, the stall holder had put some more things out. I thought the girls were gone but then I spotted them. They had been moved to one side and were lying together looking rather sorry for themselves. Well that did it. “You two are coming home with me.” I told them telepathically because talking out loud to dolls in public gets you funny looks even at a doll show. I took them to the stallholder who promptly reduced the price by five dollars so I got the pair for twenty dollars. The stall holder told me this was her original outfit. 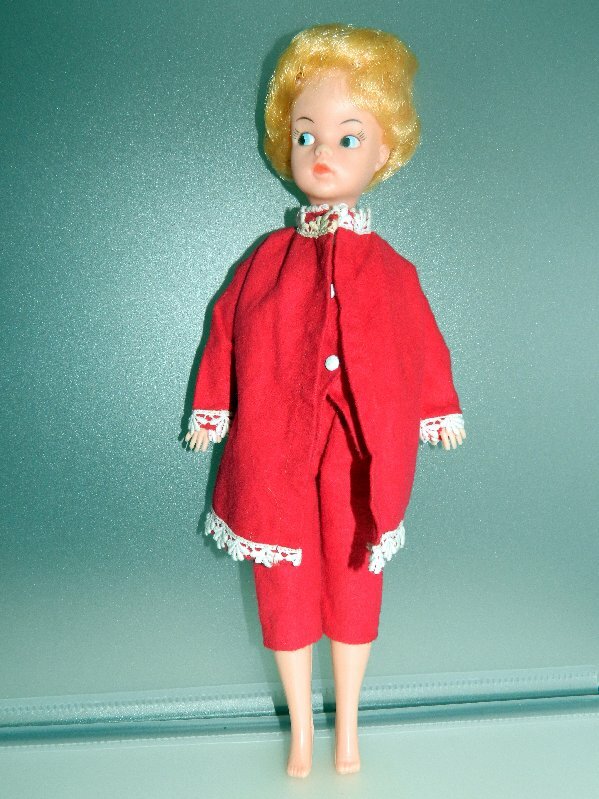 At home I found the Sindy clone a pair of Sindy pajamas and dressing gown to wear. They fit her better than they fit some of my mini Sindy’s. I have more Sindy outfits than I have Sindy’s to wear them so she can help model the collection. Sindy clone wearing genuine Sindy PJ’s and dressing gown. Here you can compare a genuine early Sindy with the clone doll. This is a very well made clone. The Sindy clone looks very much like your Sindy doll. Amazing. They must have copied the mold very well. I like both of them. There has to be room in the world for the clones. They’re real dolls, too.